The Blu-ray Disc format today has given rise to another 'high-quality audio carrier': Blu-spec CD, announced today by Sony Music Entertainment (SME). No this is not DSD, DXD or high-res PCM on a BD-ROM disc, thus creating something like a BD-Audio disc. It's yet another flavour of good old Red Book CD (RBCD), the original Compact Disc Digital Audio format we've known for over 25 years. If we interpret the information (from the Japanese press release) correctly, the idea is to apply a blue laser (as used with Blu-ray Disc) instead of a conventional infra-red laser to cut a more precise CD master with more perfect pits. This technique leads to more accurate read-out of the (16-bit 44.1kHz PCM) digital audio signal. And above all, of course, it competes with Super Audio CD for the affection and money of consumers interested in superior sound quality. As you can see from the above overview, all of these approaches relate to different parts of the creation and manufacturing process, so there seems to be no technical objection why all of these couldn't be combined into an ultimate single high-quality carrier. That could be an RBCD but we suggest is be a hybrid SACD. Where DSD-CD, HDCD, XRCD and Blu-spec CD can create a better CD layer, we think use of a blue laser could also make a yet finer SACD layer (typically recorded using a red laser) while the more transparent 'super high material' of SHM-CD would make a better disc overall. The objections are not even political but of course of financial nature. These various process improvements are surely patented and the record companies plan to license them to others, perhaps even each other. Now if only they could get their act together, agree on a cross-licensing agreement and create this ultimate carrier. We're not going to speculate about the name this should take (SHM-DSD-XR-HD-SA-CD anyone?) but of course, we are pessimistic this will happen. More likely in music shops selling physical media, already facing difficult times (not only the brick & mortar stores but probably also the online retailers) you're going to see separate racks for XRCDs, SHM-CDs, HDCDs, Blu-Spec CDs and SACDs next to the regular CDs. Sadly, the consumer will not have much choice other than between the original CD and one of these new formats: as these are 'proprietary' formats, you're not going to see a single album released in multiple formats. If this were to happen, inventory/stocking problems would get even worse. Lastly a warning is in place here: If you see a title with too many of the above disc format's logos on them, it's probably a fake from China, just like these albums by Abba, the Bee Gees, Beyonc�, Mariah Carey, Kiss and Enigma (the latter branded as a DSD CD) we've come across. China Record Co likes to wow its customers but it's pure cargo cult. You can find the complete version of this article including illustrations on our home page. If it's compatible with ALL existing CD players, then I say, great! If it can be ripped to ones media library for archiving with EAC, than even better! The thing is, how can I justify re-buying my favourite music albums if they're so expensive? And how much of an audio quality improvement does it offer anyway? It sounds like if you ripped a normal RBCD with a ripping tool with really good error correction, there would be no benefit to this, as there would be no improvement. This would only provide a benefit if there is a meaningful amount of read error in your existing direct from disc playback. It's mostly a matter of jitter reduction. If the audio mastering of an album was done perfectly, characteristics like this might make a marginal difference. Otherwise it will not make any audible difference. This is certainly not the most critical element in the chain. As concerns the combination of DSD-CD and Blu-spec CD, this may actually have materialized. Reports elsewhere suggest (consistent with our information actually) Sony has been using DSD for all their remastering the last couple of years so assuming these reissues are based on those masters, they will technically be Blu-spec DSD-CDs, even though Sony doesn't advertise them as such. More (Japanese) coverage about Blu-spec CD and competing CD types. It increasingly looks to me as if this is a Japan-only enterprise. Blu-spec CD format boasts a new approach to the faithful reproduction of music by utilizing the leading edge blue laser diode technologies optimized for the manufacturing of Blu-ray. During the manufacturing of CD, laser beam is pinpointed to encode data on the microscopic tracks molded on the polycarbonate plastic constituting the surface of the disc. Compared to the conventional laser beam used for the manufacturing of standard CD, the blue laser beam used for the manufacturing of Blu-spec CD has a shorter wavelength, allowing more accurate encoding of the data. The use of the laser also eliminates the need to use cooling fans that cause vibrations. Furthermore, polycarbonate plastic optimized for Blu-ray is used to ensure accurate reading of the data. Amazingly and importantly, Blu-spec CD format is fully compatible with standard CD players. It does not change my perception of this concept. In fact it further adds to my skepticism. Has anyone been able to try one of these Blu Spec CDs? I've recently become tempted in a couple of Jazz albums issued in this format. Time Out by Dave Brubeck and Agharta by Miles Davis. Is the sound quality a significant improvement? and what is ripping the CD to FLAC/MP3 like? And is there any difference in burning a copy of the Blu Spec CD to a CD-R with a normal red laser in a computer? Anyone know why Sony are touting on the actual discs that they are Blu-Ray discs when clearly they *aren't*? I have'nt seen anywhere where there was a claim of it being an actual Blu Ray disc. 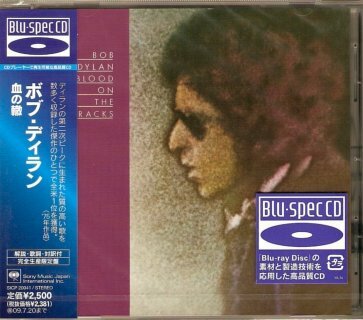 Its says Blu Spec on the CD you mentioned. I do see the mention of Blu Ray at the bottom, but I assume thats talking about the orgins of the technology. It's a fair point you make but I am still a tad flummoxed by their even mentioning another format when we know how confused the average consumer gets by all this. Or is the Japanese consumer somewhat superior? It's not as if an SA-CD has the DVD logo on it with an explanation "has something in common but irrelevant with the DVD physical format". Is the sound quality a significant improvement? That's hardly possible within the Red Book CD spec. If all steps in the production chain are done well they'll be good RBCDs but nothing more than that. and what is ripping the CD to FLAC/MP3 like? As far as there is any difference between a regular RBCD and a Blu-spec CD such difference is definitely lost when converting to MP3 and likely even when converting to FLAC. The only difference can be in reproducing the same bits with reduced jitter. And is there any difference in burning a copy of the Blu Spec CD to a CD-R with a normal red laser in a computer? Sorry, I don't understand your question completely. Do you mean whether you can copy a Blu-spec CD onto a CD-R and if the copy is still a Blu-Spec CD? The questions to that are yes and no, respectively. Also see the article on the news page. All my questions are based on Sony's claim that Blu Spec CDs are of Ultra High Quality. The Blue Spec format takes Blu-ray disc technology to create CD's which are compatible with normal CD players but provides ultra high quality sound. But if the technology is confined to the limitations of red book audio, then how is it possible? "Ultra High Quality" compared to what exactly? All my questions are based on Sony's claim that Blu Spec CDs are of Ultra High Quality. [...] But if the technology is confined to the limitations of red book audio, then how is it possible? "Ultra High Quality" compared to what exactly? Consider it snake oil of the same sort as SHM-CD. Not a real step forward like DSD and SACD. It's probably good if you want to believe it's good. I received my BLU copy of Highway 61 Revisited. It is irrefutably good, if not SA-CD territory.